You know what’s great about the Olympics, besides all the awesome sports events? It’s a wonderful introduction to world geography. 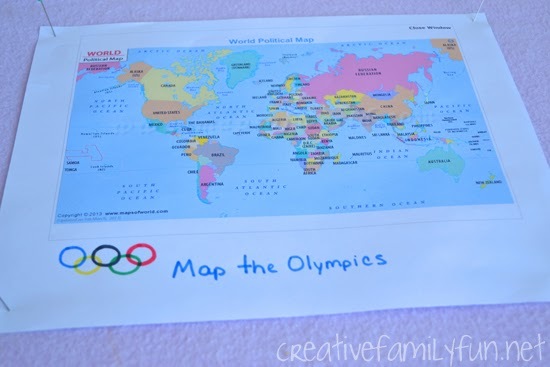 I took advantage of my girls’ natural curiosity about the athletes to show them the countries each one represents with this simple Olympic Mapping Activity. I began with a simple map of the world, which I pinned on a cork board. We printed ours out at Maps of World. I was looking for one with the countries labeled, but didn’t have the busyness of latitude and longitude lines. We then settled in with the computer and tiny flag making supplies. We used the official Sochi 2014 Website, teams section to find the different countries participating in the Olympics along with a picture of that nation’s flag. Another bonus to using the Sochi Website was that we were also able to see pictures of the athletes and could place them with their country. Special Note: You can find the PyeongChang 2018 website here if you want to do an updated version of this activity for the 2018 Winter Olympics. We began with some of the top medal winners (Norway and Canada), our country (the United States), and the host country (Russia). We then moved on to other countries that the girls found fascinating. 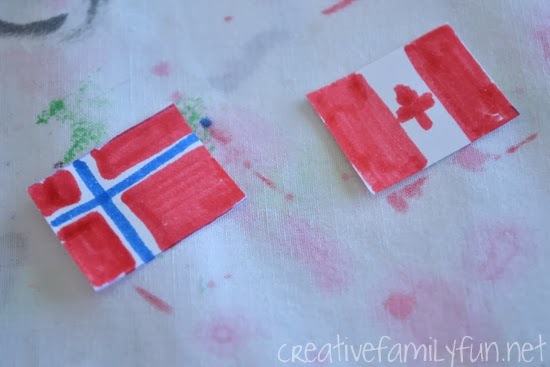 To make our flags, we used pins and tiny pieces of paper. Each piece of paper was 1-inch wide by 3/4-inch tall. We used markers to create our flags. It was a bit of a challenge creating some of those tiny flags (hello, Canadian maple leaf), but we worked at it. We left the stars off the US flag cause we didn’t have room, but we did the best we could do on them all. 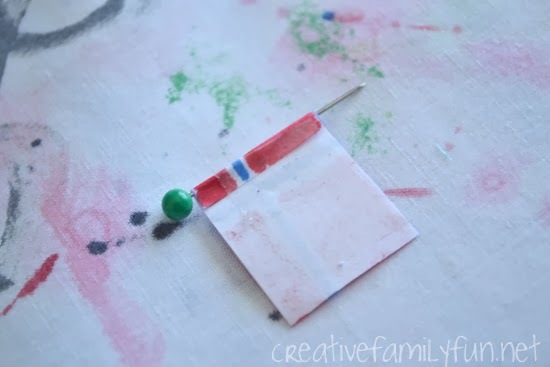 Once each flag was made, I taped it on a sewing pin (see the example in the above photo). 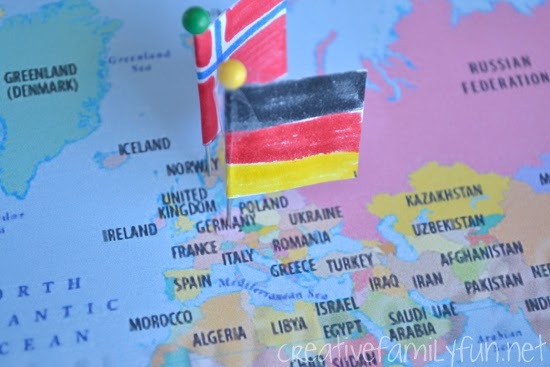 Once each flag was finished, we placed it on our map. We took note of the size of the country and where it was located. My girls could already find a few countries (US, Canada, Mexico, China, Australia), and were fascinated to see where other countries were located. They took note of just how tiny some countries are when compared to a huge country like Russia. We’ve been gradually adding flags every day now. 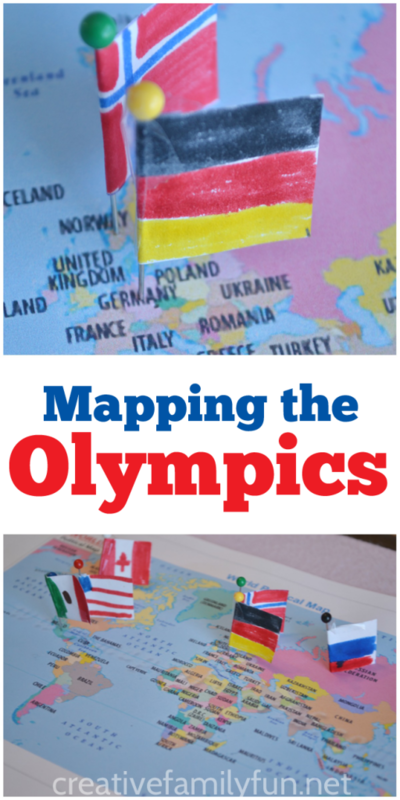 In fact, we’re still not finished with this Olympic mapping project. Quite frankly, I hope it continues for quite awhile. 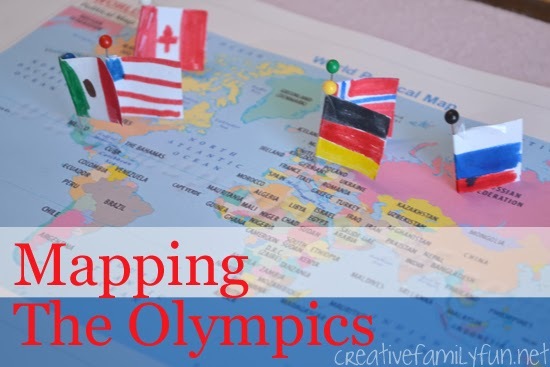 Have you been taking advantage of the Olympic Games for learning opportunities? 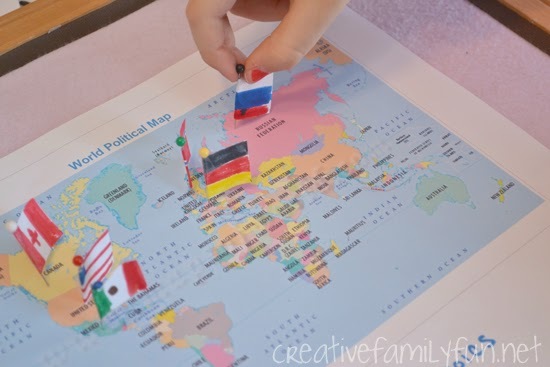 Create flags of the world puzzles. You can find the instructions at Inspiration Laboratories. Work the atlas puzzles at National Geographic. So much fun for puzzle lovers! This fascinating infographic at Colour Lovers show the colors most commonly used in flags around the world. You have to scroll down to the bottom of the page to see the full infographic. It’s so interesting!